SalesHandy is a sales communication and analytics tool to make inside sales team around the world highly productive. Companies use multiple tools to connect with their prospects. These tools generate valuable behavioral insights of the prospect, which is lost and generally not used. If these data are collected and analyzed, it can help sales team reduce sales cycle time, increase closure rate & ultimately revenue. 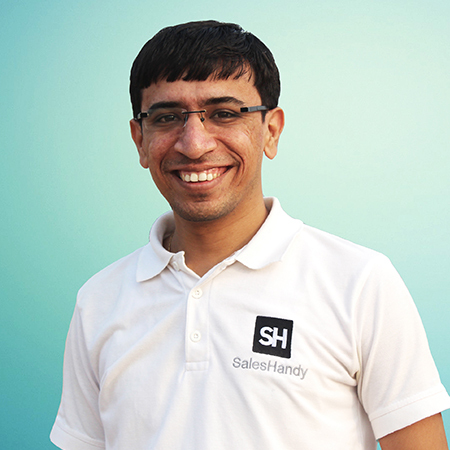 SalesHandy is a tool which collects such behavioral insight and presents them in an actionable format. We are one super dedicated, hard working team with a single focus on enhancing the productivity of sales people and helping them simplify the sales process. Earlier Co-founded SoftwareSuggest & has taken his first startup from concept to profit in less than 2 years without any external funds. We give data & insights to build meaningful,personal and productive customer relations. We are constantly improving our product dedicate to serve best user experience. The way to help yourself, quickly find what you want and reduce getting frustrated. We have been able to increase the productivity of our inside sales team by 32%, with saleshandy. It works MAGIC for us. SalesHandy has been very useful for me. The software is good and improving continuously. And the team is responsive with its support process.